Pregame parade is at 5 pm. Participants should show up 4:45 pm. 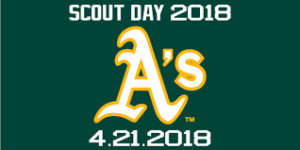 Please join us for the Oakland A's vs the Boston Red Sox which features a pregame festival in the parking lot with a wide variety of activities, an on-field parade for uniformed Scouts and leaders, a commemorative patch for all participating Scouts, and a discounted game ticket. This event is open to Boy Scouts and Girl Scouts of all ages, as well as their families and friends. All uniformed Scouts and leaders will receive a commemorative Scout Day patch. We will reserve a specified number of lower level seats on the Plaza Infield based on responses to the Evite. These will go first come first serve to those that pay sign up and pay. Plaza Infield tickets are $28 per scout and $28 per additional family member. Since there are limited seats, we are asking everyone to not sign up unless you are positive you are going to go. Once you sign up, you are committed to purchasing the tickets. There will be no refunds. If you cannot make it, it is your responsibility to find someone to take your tickets.